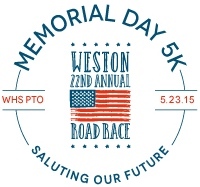 The Weston Memorial Day 5K Road Race and Walk is marking its 21st year as one of the premier 5K races in the state. The race is Weston High School's largest fundraiser, with funds going to current and future school enhancements and educational initiatives. The Weston course is a fast, rolling, scenic loop through residential and historic sections of bucolic Weston. It starts and finishes in front of the Weston High School. Race registration is open. Click here to register today! Complimentary Weston 5K Road Race T-Shirt for the first 500 registrants. All Kids Fun Run participants will receive youth fun run shirts.